Ladies and gentlemen, I present you with the world’s worst fuel cell headline. 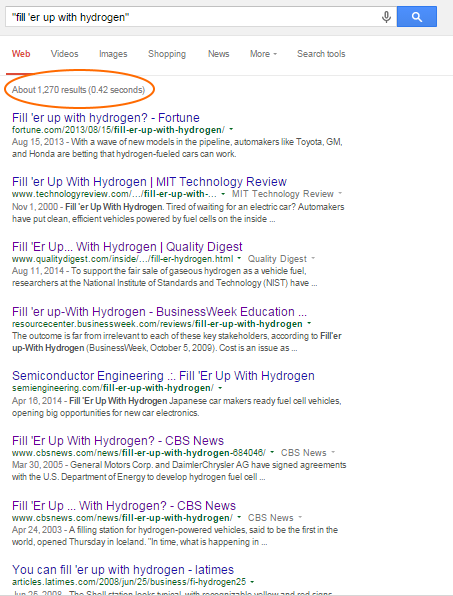 Use it and you’ll be just as original as the 1,200 other people who have used the title over the years – like the LA Times, MIT Technology Review, Fortune, Associated Press, Bloomberg, Popular Mechanics, and everyone else who’s ever heard of a hydrogen fuel cell. The phrase itself is almost 70 years old – an Iowa State engineering magazine used the phrase when describing a hydrogen-powered rocket motor. ← Dude, where’s my fuel cell car?